The big Asian grocery store not far from my house had a great lime sale—20 limes for $1.00—so I came home with a bag of 20 limes and plans to make several lime dishes. 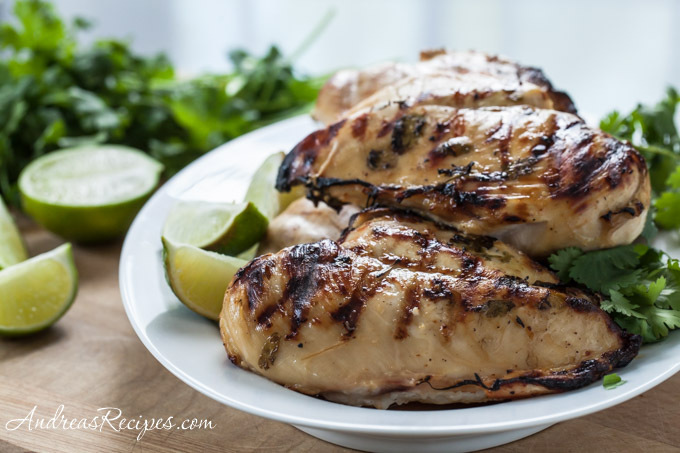 This weekend we grilled some of this tequila lime chicken, which has become a favorite for us. How long should you marinade chicken in a citrus-based liquid? Overnight or no more than a couple hours? For years I’ve heard you should not marinade your chicken in citrus liquids for more than an hour because it starts to “cook” the chicken, meaning that the outside layers of the chicken meat start to take on a white, cooked-like appearance. So of course when I saw recipes which called for marinating your chicken overnight in lime juice and other ingredients, I was skeptical and thought for sure that the chicken would be ruined. But I also saw many comments online at various cooking forums and recipe sites where people swore that their chicken turned out fantastic when marinating overnight and that it was tender and juicy, not tough or overcooked. So this year I finally decided to try it and risk ruining a batch of chicken, and I am so glad that I did. Yes, the outside of the chicken does turn white, but when grilled the chicken is flavorful and tender. This recipe is now a favorite, and the chicken makes great fajitas. I make a large batch so that we can have leftovers for salads. In the medium bowl, stir together the lime juice, orange juice, tequila, cilantro, garlic, salt, and pepper. Put the chicken breasts into the freezer bags, 3 per bag, and pour the marinade over the chicken. Turn the bags over a couple times, then put them in the refrigerator for up to 12 hours. Preheat the grill to medium heat, and brush the grill rack with oil. Grill the chicken 10 minutes on the first side, then turn and cook another 8 minutes. Slice the chicken diagonally across the grain and serve with the fajita accompaniments. Prep time includes marinade time. If you want to marinade for just a few hours, try slashing the chicken in a couple places before adding the marinade. This will help the flavors to penetrate better. Michael likes to pour the cooked marinade over his fajitas. (If you choose to do this, please make sure you boil the marinade, not simmer. You want to kill any bacteria that may be present.) Reserve the marinade and bring it to a boil in a small pot, cooking for about 10 to 15 minutes, then remove from the heat and allow to cool for a few minutes. Sounds great. I often marinate chicken all day in the fridge while I’m at work and it turns out wonderful. What a deal on the limes! I have never heard that debate about marinating times with citrus. I usually marinate everything overnight as a preference – I think the flavor is better that way. This recipe sounds wonderful – I’m going to have to give it a try! What a great deal on the limes! Looking forward to trying these on the grill next weekend. Kalyn, all your chicken recipes continue to inspire me! Deborah, yes I should have given in on this one years ago. I’ve always marinated red meats overnight but the chicken/citrus thing stuck with me. Glad I got over it! Alanna, thank so much for the shout-out! I always think of how cheap limes are here compared to the US, but then I must admit, you got such a great deal! That marinade looks terrific, I did kabobs last weeke and left them marinating overnight with lime, also I had the same concern as you did, and found out the same. The tequila seems like a great addition! 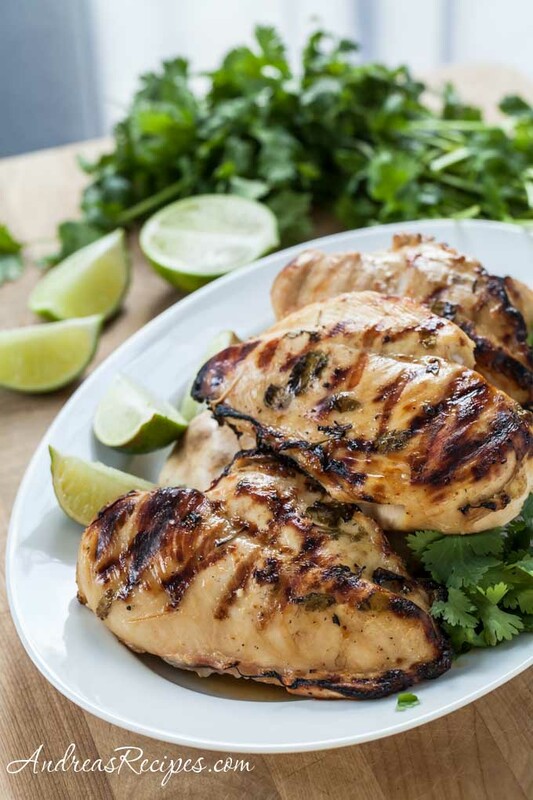 Thank you for writing this- i just used bitter orange and let my chicken marinade overnight, then when i saw the chicken turning white i thought all was lost 🙂 Now i can not wait to get it on the grill. I always add some oil to my maranade. Will it help or hurt if I add some–or do you feel that it is not necessary? This recipe sounds great. I made it this evening and plan to maranade chicken tenders with it and then grill them. I’m working tomorrow so I’m not going to put the maranade on until right before I leave for work. THANKS! Hi Janet. It’s not really necessary. The chicken gets very tender with all the citrus in the marinade. Just remember to oil the grill a bit before you put the chicken on. Anything with Tequila is good! hee heee! Sounds wonderful and I am trying next weekend.